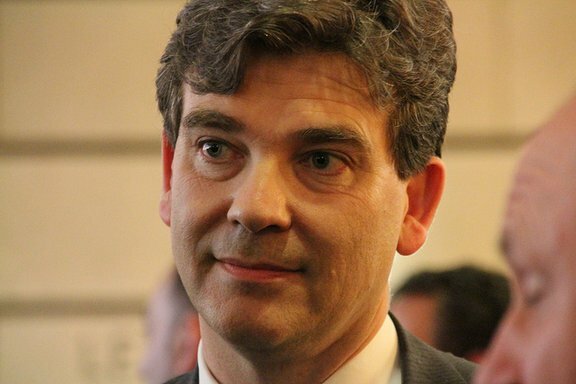 EXCLUSIVE / Arnaud Montebourg, the firebrand French Industry Minister, launched a scathing attack on the EU's "stupid" competition and state aid rules, claiming they are "counter-productive" because they prevent the creation of Europe-wide industrial champions. In an interview with euractiv.fr, he also spoke in favour of a weaker euro to support exports and restart industry. Montebourg, whose ministry for "industrial revival" mixes industry, SMEs, the digital economy and innovation, told euractiv.fr that “European rules are the rules of the old world". "We need to overcome these obsolete rules as they don’t correspond to a globalised economy," he said. According to him, the EU's state aid and competition rules have contributed to the “balkanisation” of companies by preventing the emergence of Europe-wide industrial champions. "This is where there is a real problem. Just look at the market capitalisation of European telecoms groups compared to the US Verizon. Europe organised the balkanisation of its companies by chasing down state aid. It was a stupid and counter-productive policy." By contrast, he said China and the US do not hesitate to support their own enteprises and spoke out in favour of state intervention on economic matters, recalling that governments had injected €500 billion into the banking sector during the eurozone crisis, creating "mountains of debt" while industry "got zero". In the meantime, Montebourg said the EU has applied the wrong recipe to emerge from the crisis. "The fiscal and monetary policies of the European Commission are catastrophic. Raising taxes and waiting for the crisis to go away, it never worked," he claimed. Instead, the French Minister argued that monetary policy must by used as a lever to restart economic activity in Europe. "The European currency is too strong, it is too expensive. We need to change monetary policy urgently," he said, adding: "there is no mystery, you have to practice a more flexible monetary policy and inject money into the economy." "This is not me saying it, it is a great economist, Joseph Stiglitz: no economy has ever emerged from a crisis without the use of monetary policy. Today we see Japan, the United States going out of the crisis gradually, and in Europe there is no growth!" The Minister also reminded the Commission that it needs to take its time on the trade and investment negotiations that are underway with the US. “If the agreement is rushed, the citizens’ anger will show at the next EU elections," he warned. His advice for the election of the next EU leaders was to go for a political approach rather than supporting a French candidate at all costs: “We need to support a politically committed team that will be ready to help Europe’s recovery by using monetary and budgetary means." What else could you expect from the French establishment? Thank God there are not too many people who are interested in his ‘advice’. Montebourg is a communist and he has to compete against Front National. The French are worried, because their super state is running out of money and they want the EU budget to plug this hole. This should be absolutely avoided! It seems ironical that a communist is more interested in the fate of corporations than consumers. But it’s understandable – big corporations offer nice posts for Montebourg’s friends and lots of cash for his super state! The truth is that for Montebourg “EU-wide champion” is a French company by definition. I think he want to say the federal rules for the EMU! In other Words common fiscal policies with an common treasury and a depth generalizing! I have to say a federal currency has to manage this way! Some federal policies rule which Europe still hasn’t applied ! He has right !! The European leaders try try pussyfooting on national level! Why ? Since AL economist knows if the U.S. will handle that way they even will experience microeconomics imbalance . Australia Switzerland Germany U.S.A all are federal ! Actually, there are some pearls in the muck of Montebourg’s mad ideas. The EU should indeed support the rise of big pan-European corporations, like the Verizon in the US.